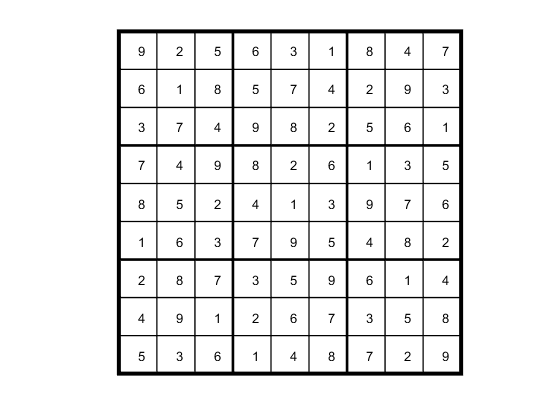 This example shows how to solve a Sudoku puzzle using binary integer programming. 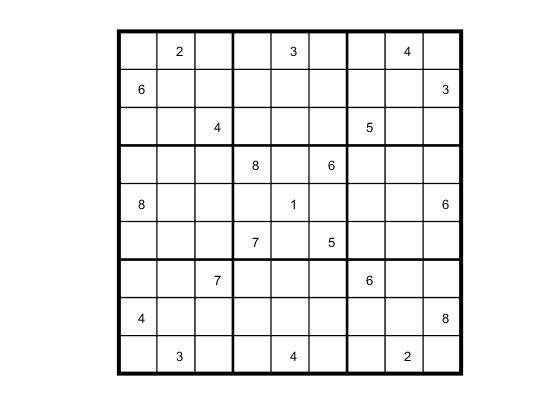 For the solver-based approach, see Solve Sudoku Puzzles Via Integer Programming: Solver-Based. You probably have seen Sudoku puzzles. A puzzle is to fill a 9-by-9 grid with integers from 1 through 9 so that each integer appears only once in each row, column, and major 3-by-3 square. The grid is partially populated with clues, and your task is to fill in the rest of the grid. Here is a data matrix B of clues. The first row, B(1,2,2), means row 1, column 2 has a clue 2. The second row, B(1,5,3), means row 1, column 5 has a clue 3. Here is the entire matrix B.
drawSudoku(B) % For the listing of this program, see the end of this example. This puzzle, and an alternative MATLAB® solution technique, was featured in Cleve's Corner in 2009. There are many approaches to solving Sudoku puzzles manually, as well as many programmatic approaches. This example shows a straightforward approach using binary integer programming. This approach is particularly simple because you do not give a solution algorithm. Just express the rules of Sudoku, express the clues as constraints on the solution, and then MATLAB produces the solution. The key idea is to transform a puzzle from a square 9-by-9 grid to a cubic 9-by-9-by-9 array of binary values (0 or 1). Think of the cubic array as being 9 square grids stacked on top of each other, where each layer corresponds to an integer from 1 through 9. The top grid, a square layer of the array, has a 1 wherever the solution or clue has a 1. The second layer has a 1 wherever the solution or clue has a 2. The ninth layer has a 1 wherever the solution or clue has a 9. This formulation is precisely suited for binary integer programming. The objective function is not needed here, and might as well be a constant term 0. The problem is really just to find a feasible solution, meaning one that satisfies all the constraints. However, for tie breaking in the internals of the integer programming solver, giving increased solution speed, use a nonconstant objective function. Each initial value (clue) can be expressed as a constraint. Suppose that the (i,j) clue is m for some 1≤m≤9. Then x(i,j,m)=1. The constraint ∑k=19x(i,j,k)=1 ensures that all other x(i,j,k)=0 for k≠m. Create an optimization variable x that is binary and of size 9-by-9-by-9. Create an optimization problem with a rather arbitrary objective function. The objective function can help the solver by destroying the inherent symmetry of the problem. Represent the constraints that the sums of x in each coordinate direction are one. Create the constraints that the sums of the major grids sum to one as well. Include the initial clues by setting lower bounds of 1 at the clue entries. This setting fixes the value of the corresponding entry to be 1, and so sets the solution at each clued value to be the clue entry. LP:                Optimal objective value is 405.000000. Round the solution to ensure that all entries are integers, and display the solution. You can easily check that the solution is correct. % we subtract 0.5 to center the clue in the box.